Dubai is currently the cultural center of the world. It is a multicultural community. Dubai hosts Dubai Fashion Week (DFW), which is a ‘by invitation only’ Fashion Week. It is a five day event and it takes place twice a year. This global event plays a great role in bringing together the stakeholders of fashion industry by providing them a single platform. It enables the local and regional brands and designers to present their collections to their potential buyers, media, fashion experts and general public. The event has also invested in young talent with its ‘Emerging Talent‘ initiative which aims to help the upcoming designers to interact with industry professionals. Dubai Fashion Week is owned and organized by Capital Marketing FZ LLC. 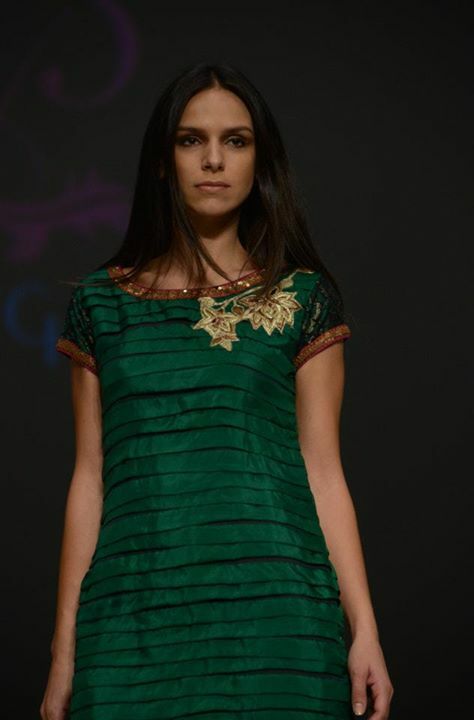 The event showcases the creations of Indian American Designer Parna Ghose under the label of “Pure Elegance“. Parna got the basic knowledge of fashion by working with experienced designers at a very young age. This native of India has taken up the challenge of blending the trend and tradition effectively and efficiently to make the Indian fashion relevant among the international audience. It was the first time ever in 2011 Dubai Fashion Week that a designer from outside of India was invited to display the Traditional Indian Clothing like Indian Saree Designs, Bridal Wear, Shalwar and Kurtis. The brand is the first of its kind in the USA that blend the Indian fashion and accessories with Western Clothing and Jewellery, so it has a lot to offer to the global audience. Plus, it plays a major role to add to the of Bollywood Fashion. 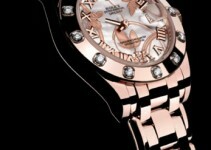 “The hallmark of our design is in its flawless craftsmanship and attention to detail. We focus on bringing out the individuality and exuberance through our unique, unforgettable pieces” said Parna Ghose. The brand became highly popular among the local and international public because of the fusion of the east and west it provides. Pure elegance is one of the fastest growing south Asian Fashion Brand and it has been successful in other global fashion weeks as well, like the Washington DC Fashion Week. 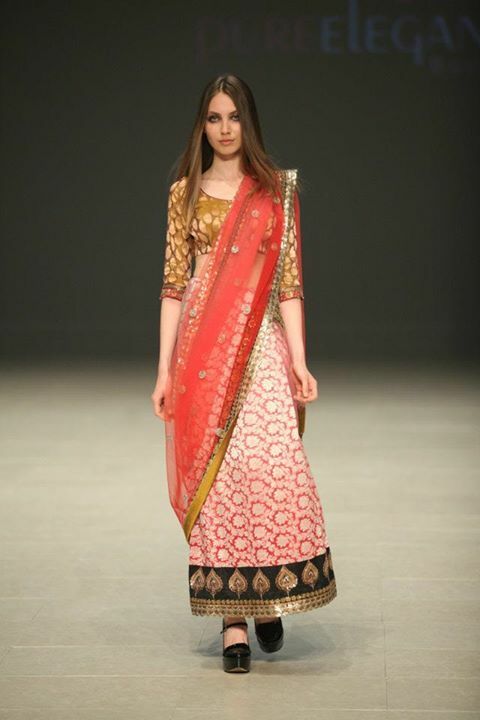 As mentioned earlier, “Pure Elegance” is all about the fusion of Indian Fashion and Western clothing. The designer has kept Indian influence dominant in her collection. She uses sharp and lively colors in order to keep her creations very close to the typical south Asian Culture. As models walk on the ramp, the regional and foreign audience get a very good guess of what formal Indian clothing is all about. Parna has displayed Indian Saree Designs and other Formal Dresses such as Kurtis and Lehengas in which the use of vibrant colors and the western blend can easily be seen. 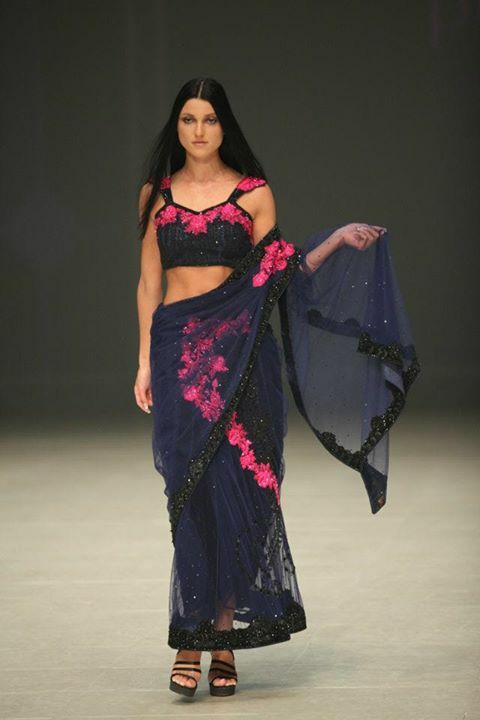 In the history of Indian clothing, Hot Saree is traced back to the Indus Valley Civilization. It is mostly worn by traditional Indian women and is equally popular in Bollywood film industry. The designer has played with all kind of colors in her collection, from simple white, brown and grey to the sharp red, orange, pink, blue and gold. Also, she has tried the traditional embroidery on the clothes. Embroidery work is extremely popular in the south Asian region in countries like Pakistan, Bangladesh, Sari-Lanka and Nepal. Then, we can see the use of glitters in the clothes. This kind of work is also very popular in formal and wedding dresses among both married and unmarried south Asian Women. Printed Sarees provide the versatility of things one can do with these clothes. The use of velvet in clothes can also be seen and this idea is currently very frequently used and liked in dresses. We can also see Multi-Shaded Dyed Clothes, another frequently used technique in Indian fashion. Firstly, it should be appreciated how Parna has worked with different shades of same color in a single dress. She has wisely used these shades to come up with a dress that gives a very nice overall look. Most of the time, the designer has used vibrant colors to give the formal look to the dress. But then, she has also used dull colors in her printed collection. It can be seen how intelligently the designer uses black, orange, dull green, grey and different shades of brown to come up with a Beautiful Hot Saree. Parna has shown a lot of creativity with the contrast combinations. The contrast of red and silver looks extremely beautiful and eye catching as model walks on the ramp. Red is the traditional color of bridal wear in the Indian wedding ceremonies. She has worked brilliantly with other contrasts as well, for example orange and purple, red and blue and pink and blue. In short, Parna has made great effort to make the Indian Saree Designs Dresses look wonderful and elegant. Dubai Fashion Week is very successful event worldwide. On one hand, it benefits the designers and provides them a platform to unveil their latest collection to the buyers, while on the other hand it provides opportunities to the buyers to preview and plan their orders. The event, in short, is not only popular among media but also among general public and the social networking websites.